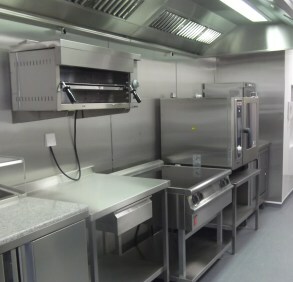 Ruggles & Jeffery has just completed a fast track refurbishment project that delivered a fully operational commercial kitchen installation along with various associated works in the basement of Number 63 Bayswater, a prestigious Hotel in London’s West End. The existing kitchen was stripped out and various walls and partitions were relocated to improve the available space. We installed new vinyl floor coverings, vinyl wall panels and suspended ceilings, followed by the installation and commissioning of the specified commercial catering equipment. We also refurbished the guest servery area and created a new staff room and laundry area; both were fully fitted out as part of the project. We carried out tanking works to under-road basement vaults at the front of the property; these were then refurbished and converted into store rooms. The front basement courtyard was decorated and a new external lighting system was fitted. We acted as Main and Principal Contractor throughout the project and we were supported well by our Catering Equipment Specialist, Fatboys Limited. 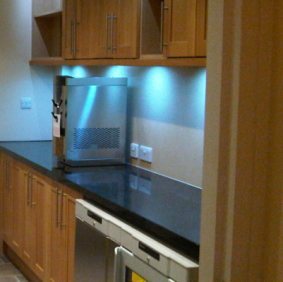 The client was delighted with the finished project and we were commended for delivering such a high quality job on time and to budget. Number 63 is a boutique hotel nestling in the heart of London’s West End with spectacular views across Hyde Park. The Hotel is owned by Soroptimist International and run by a Board of Directors elected by Soroptomist members. Soroptimist International is the largest women’s service organisation with consultative status at the United Nations. Soroptimist has members throughout the UK and across the World. Number 63 is open to everyone.